Cycling in winter can be hard work – putting on base layers, gloves, hats, warm jackets, shoe covers…more gloves, an extra hat, oh and then you go out and still lose feeling in your extremities. That’s why it’s so nice to be able to get out in short sleeves and shorts when on holidays in Gran Canaria. We’ve been going there for 8 years now at Christmas and I’ve discovered so much of the beautiful island on bike – both off road on trails and on road. The scenery is spectacular, the climbs never ending and the rental bikes are top notch. 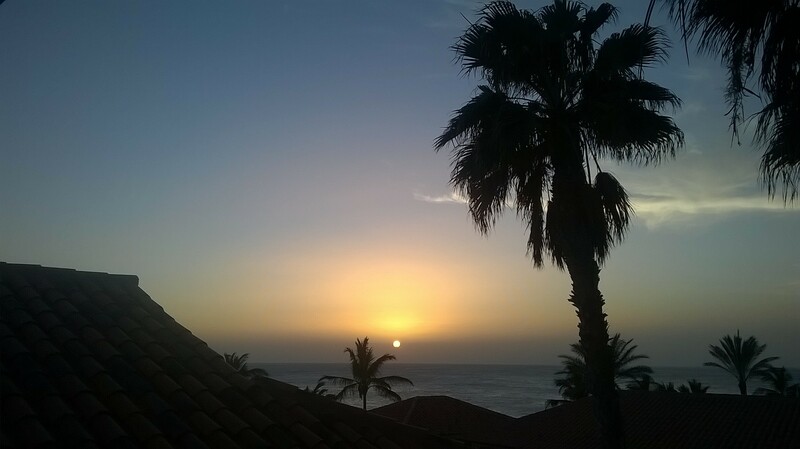 Gran Canaria is a volcanic island which rises to 1950m in the centre. Most people know the beach resorts in the south (Maspalomas, Playa del Ingles, Puerto Rico, Puerto de Mogan), but you’re missing out on so much by not going inland and up through the valleys. Based in Maspalomas, you can take some coastal roads to the east or west, but eventually you’ll need to climb inland. 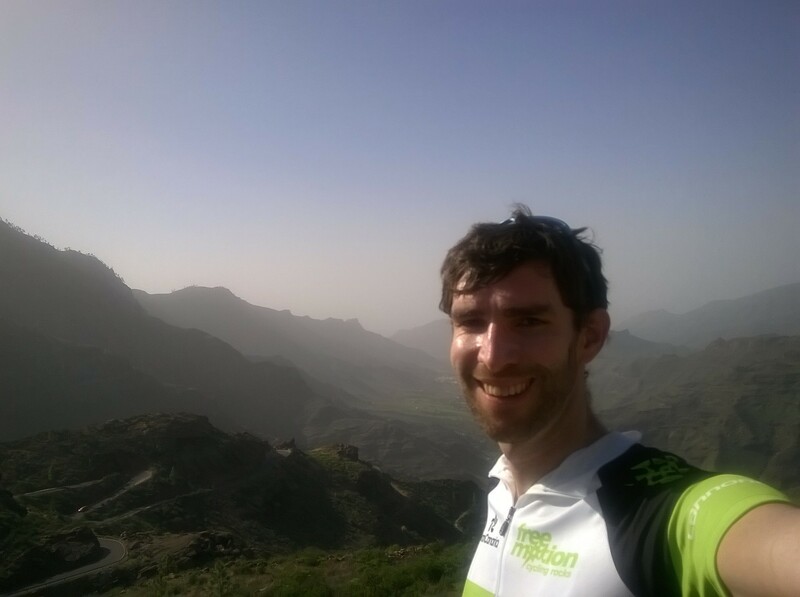 Gran Canaria and Tenerife are unique in the length of climbs – no too many mountain ranges allow you climb from 0m to 2000m with hardly any descending over 30-50km. I like the route west, about 30km to Puerto de Mogan, passing lots of towns on the way. 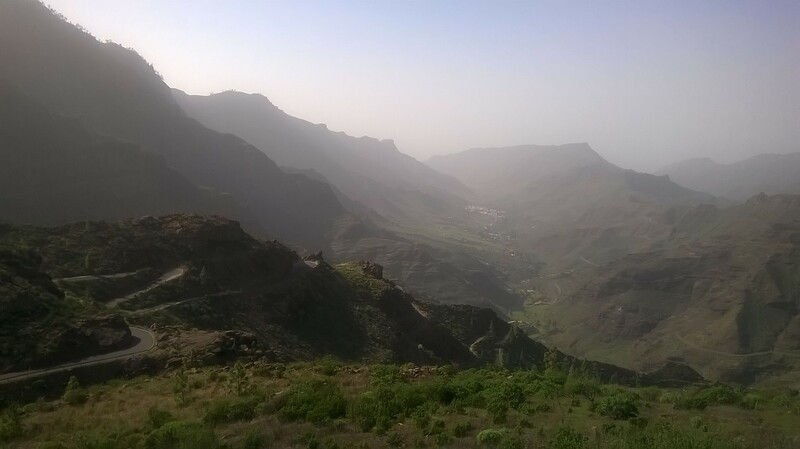 You climb gradually towards the old town of Mogan, you then hit a wall, the Tauropass climb. It’s my favourite – over 9km you climb 700m (7%+) through pine tree lined switch backs, on a really smooth tarmac road. All you can hear are wheels spinning, heavy breathing, the odd car or motorbike and birds or dogs in the distance. There’s no talking – no point wasting oxygen on idle chat…. it can wait ’til the top. There’s still another 400m of climbing to reach a popular pit stop – Bar Casa Melo in Ayacata. Relax in the sun with a cafe con leche, a cola or a bocadillo before continuing the ride. See route on Strava. This is an iconic climb that I completed for the first time this year. And I’m glad that I did – the views from the top are worth the 3:20h of climbing beforehand. For years I’d looked up at the wall of rock that falls straight down for over 500m behind San Bartolomé. You see the radar spheres and communication masts above the clouds and wonder, would I be able to get up there? It could be 23C by the beach, but there could be rain or even snow at the summit. Cyclists told me bring gloves, jackets and arm warmers. It’s hard to believe when you’re toasting in the winter sun. Starting at sea level in Playa del ingles, we went straight up – through San Bartolomé at 920m and past Ayacata 1,330m. Then the steepest part with 12-14% gradient to Roque Nublo. Our group of 8 hardly spoke on the entire climb… They were all nice people, but 100% of our energy and concentration was going into pedalling, so small talk could wait. The last 300m climb wasn’t as tough as I expected, although my legs were tired and the group was fast, so no let up. The panorama from the top was amazing – we could see down the Fataga valley to the south, but it was breath-taking to see the snow-capped peak of Teide rise about the clouds to the west in Tenerife. At over 3,800m high, it was like a mountain floating in the clouds. See route on Strava. 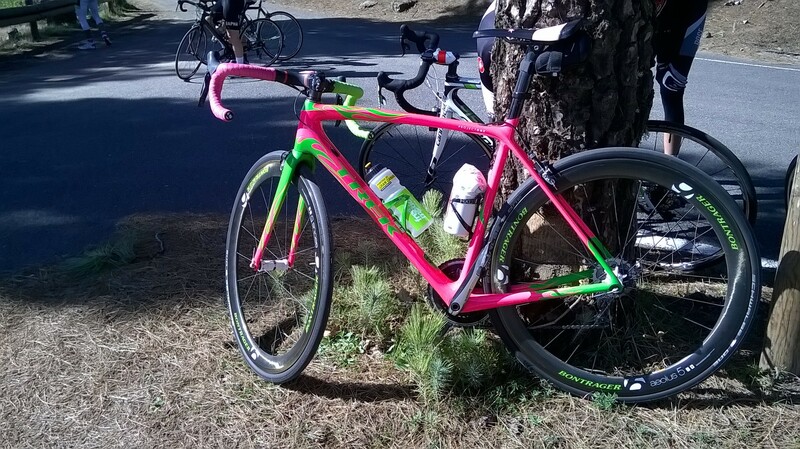 Matthias had a girls bike – a bright pink Trek! Now the fun part – the descent. Nearly 2,000m of descending – it’s like skiing, when you get off the highest chair lift and have the whole mountain beneath you. We descended through Santa Lucia, a pretty town to the east of San Bartolomé. It’s my favourite descent – so much fun as it’s all twists and turns for over an hour, with the valley opening up beneath you. Descending in a group is safer, as our leader Mathias picked the line and we could follow. It was still hairy – flying around so many blind bends, with cars and bikes on the way up. I realised cycling is so technical when descending, it’s like Formula 1 – all about braking points, taking the apex, then accelerating as early as you can. For those guys who were good at it, they just pulled away. Definitely something to practice and build confidence. See route on Strava. The hardest part for me was actually the flat – from El Doctoral we have 10km on the flat back to Playa del Ingles, with a strong tailwind. A real experience of being in a peloton train – 8 of us bombing along at 50kmph. When we’d go through a roundabout, if you backed off for even an instant, you’d lose the wheel in front and suddenly you’re gone. Your heart rate is through the roof (150bpm+) and you dig deep to stay on that wheel. No time for a drink, just pedal that big gear. Then a slight gradient comes and the train accelerates on up. The wheel gap grows. Your legs are spinning hard, you’re breathing like a 100m sprinter, yet you can’t hang on. The gap grows metre by metre. You realise the battle is lost, you’re in no man’s land and will never catch the group. Such a tough experience – you think the climbs are hard but now realise the flat sprint is way harder. Now I understand a little bit better how tough these pro cyclists are – I was shot after 100km in the mountains, yet these sprinters can muster enough power to put the foot to the floor and find a top gear. Respect. A new route I took this year was to visit the centre of the island. 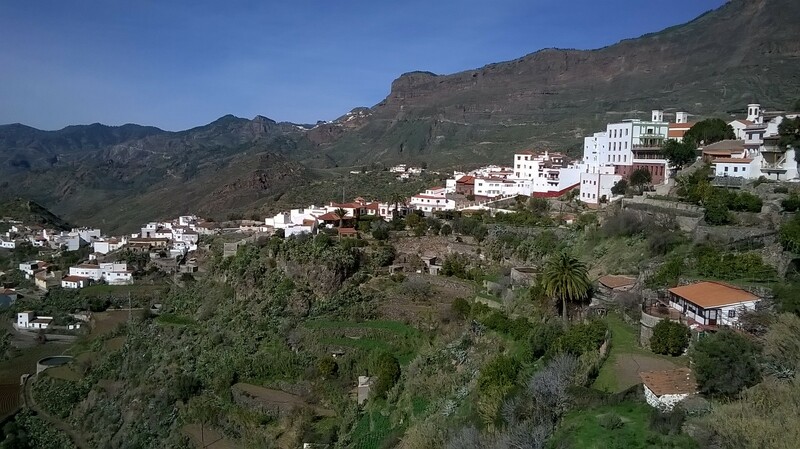 Tejeda is a pretty mountain town, full of white washed old houses and panoramic views of the huge lush green valleys to the west (very different to the arid south). Continuing past Ayacata, I thought it would be a nice loop. Little did I realise I’d climb 2500m that day, on a 6 hour ride! But it was worth it, as you have views of Teide in Tenerife for long parts of the circuit. 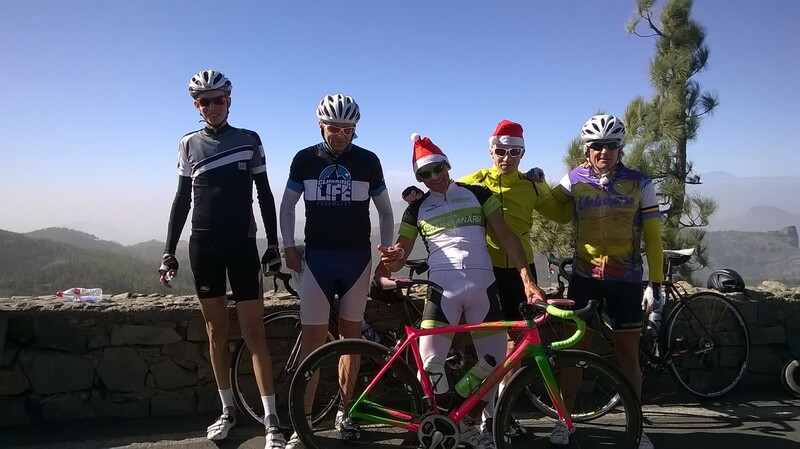 There’s also a tough climb of 700m up past Cruz de Tejeda to Llanos de la Pez. Again the views ae stunning – you can see Las Palmas to the north. The landscape is also much greener, lots of lush grass and terraced fields for farming. You also notice the change in temperature – about 10C colder up at 1,700m than it is down the valley (a welcome change when climbing. There was a great pastry shop in Tejeda – famous for their almond (almendra) pastries – check it out: Dulceria Nublo. See route on Strava. Free Motion is top notch for bike rental. The whole setup is so professional – every year they have the latest Cannondale bikes (mountain and road), which are in tip top condition, so practically like new as they’re cleaned and maintained by the excellent staff. This Austrian company has over 500 bikes. I rented a Supersix Evo Ultregra 2015 (the same bike I have at home). You can rent the bike and do your own thing, or you can join group rides, which are great if you don’t know the island roads. Plus cycling in a group is more fun (and easier). Each day they have 2 road tours and 2 mountain tours, based on ability. The “expert” or fast road group is for good fit cyclists, as the average speed is 25kmph+. I’ve done a few rides and fond them great motivators to keep combing steady. They wait for everyone periodically, so when the group gets spread out on a climb, there’s no pressure to keep at the front. Group tour are recommended for mountain biking, as they’ll drive you and your bikes up to say 1,300m in Ayacata and you can descend or go cross-country from there. Saves you hours of climbing and lets you explore some super trails, where you see such unspoilt and remote parts of the island (my favourite was the Mogan XL tour – lots of climbing on the west of the island).